February was a tough month for the Maple Leafs, it saw: the Leafs fall into 12th place in the Eastern conference, Torontonians break swearing records and our media-friendly coach Ron Wilson get fired. Ron Wilson was on his way to becoming one of very few coaches to lead a team into four straight years of early golfing and ridicule when Brian Burke decided that the Toronto Maple Leafs would be Wilson free for March and onward. As astonishing as it is the Leafs are actually still in the thick of this fight, sitting five points back of eighth place in the East with two games in hand. The troubling part of being five points back of eighth, is that there is a real possibility the Leafs pick up zero points this week. They are playing Boston on Tuesday, Pittsburgh on Wednesday, Philadelphia on Saturday and Washington on Sunday. Not only are all four of these teams ahead of them in the standings but three of them are in the "elite" class as far as hockey teams go. Not to mention the Leafs are dreadful in the tail ends of back to backs. One thing that can save the Leafs from certain doom this month is our newly arrived bench boss. Randy Carlyle - by all accounts - is trying to integrate a defensive system into this "run and gun" team, something that should see the Leafs continue to be offensive while being cautious in the defensive zone (this doesn't seem like rocket science to me). Mike Komisarek seemed to reap the rewards of this new found way of playing hockey on Saturday night, drawing in against his former team (and the last team to see him play good hockey) and having a pretty good game. Carlyle seems to love matching his lines, something that Ron Wilson wasn't very good at - we saw Kessel's line taking a defensive zone faceoff in the dying seconds of a game one too many times. Grabovski, MacArthur, Kulemin and Frattin will likely see their minutes sky rocket under Coach Carlyle seeing as they are defensively responsible and capable of scoring (in Grabovski and MacArthur's case). Another good sign from Saturday night is that the Leafs, usually dominated by puck possession metrics at a close score, had a +24 Corsi rating on the night against Montreal (only trailed for 29 minutes), limiting them to 22 shots. After the Habs took a 1-0 lead in the first period the Leafs seemed to settle into their roles and mount a meaningful fore-check for the rest of the game. 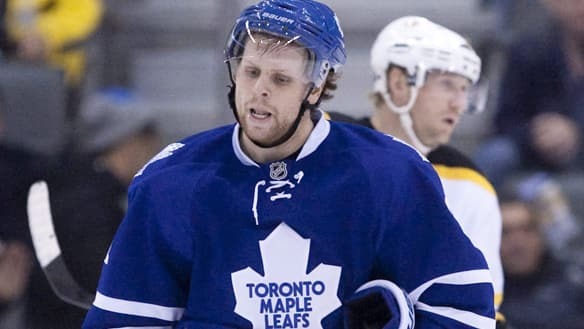 If the Leafs are to get squashed by the New York Rangers in the first round of the 2012 playoffs, they are going to need a lot more games of this calibre to earn that right.